It’s so fun when you discover a ski mountain that has its own distinct vibe. Powder in Utah is it. This humble but huge ski mountain – Powder – began in 1972, but you could say it’s just getting started. 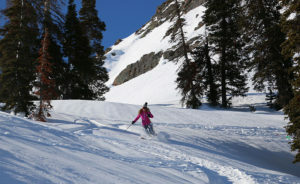 Powder is so unique, up a black diamond access road from Eden, you will find homey alpine lodges and mostly fixed grip lifts, with skiing in all directions – dozens of maintained trails, even two in-bounds cat ski operations, plus guided side country tours – skiing in all directions. Powder has 9 lifts total including a high speed Hidden Lake Express quad as the centerpiece serving groomed boulevards for family friendly skiing. Powder is 100% natural snow, and totally authentic. Powder is definitely among our Top 10 Utah Family Ski Resorts. Powder Mountain’s ski lift are primarily slow relaxing rides up incredibly scenic snow covered slopes, 2,876-acres of lift served terrain. The pace is slower, the vibe is health, outdoorsy and friendly. Ski instructors offer all day kids camps, and ski guides are available to tour mom and dad around the 5,081 acres of side-country terrain for powder, cat skiing and off-piste adventure, within Powder’s vast privately owned terrain. Powder feels private, uncrowded, un-hurried, they limits ticket sales to 1,500 skiers a day. 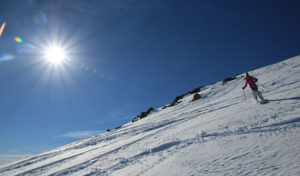 Powder is owned by The Summit Group, an organization of brilliant business minds, tech startup entrepreneurs, artists and band members who purchased Powder Mountain Ski Resort in 2013 for a reported $40 million including 10,000 acres, and six peaks in the Wasatch Mountains near Snowbasin. Cofounders Elliott Bisnow, Brett Leve, Jeff Rosenthal and Jeremy Schwartz are planning Summit Powder Mountain Village at the top with an eventual development of 400 modern alpine homes, all ski in ski out in a mod minimalist design, plus community centers for social events including their annual Summit Series that gathers 1,000 genius minds at Powder each summer, the movers and shakers for “new media platforms and old-school conversation,” and activities from “ropes courses to robots”. Nicknamed ClubTed, the Summit go’ers aim to “build community, catalyze entrepreneurship, address global issues, and support artistic achievement, in an effort to make our world a more joyful place,” according to their Facebook page, yes Mark Zuckerberg is on the list, along with Richard Branson. For now Powder has a nice mix of locals and folks from away. Powder’s original founder was Dr. Cobabe in 1972, a local physician, and son of the sheep rancher that owned this land. Tributes to Cobabe remain on the ski slopes, and the 70’s vintage but vibrant Powder Keg après ski bar in the rustic Timberline Lodge. The proposed Summit Village at the mountaintop will be a planned private community of restaurants, concert pavilions, a recording studio, sophisticated labs and incubator, and minimalist luxury alpine homes for the yuppie members- founders of Facebook, Zappos, Twitter, sports celebs, musicians and stars. It will be fascinating to see the Powder’s Summit evolve. You should take your family to ski Powder Mountain’s amazing terrain now, and keep an eye out on all that’s happening at the Summit Powder Mountain development. 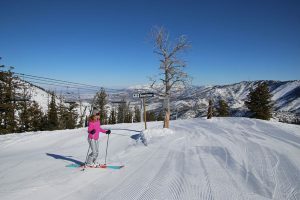 For a fun family-friendly affordable ski vacation, stay at Powder Mountain Getaways condos in Moose Hollow, just down the Powder access road in Eden. Your beautiful condo has a fireplace, scenic deck, and includes use of the sports facility nearby. 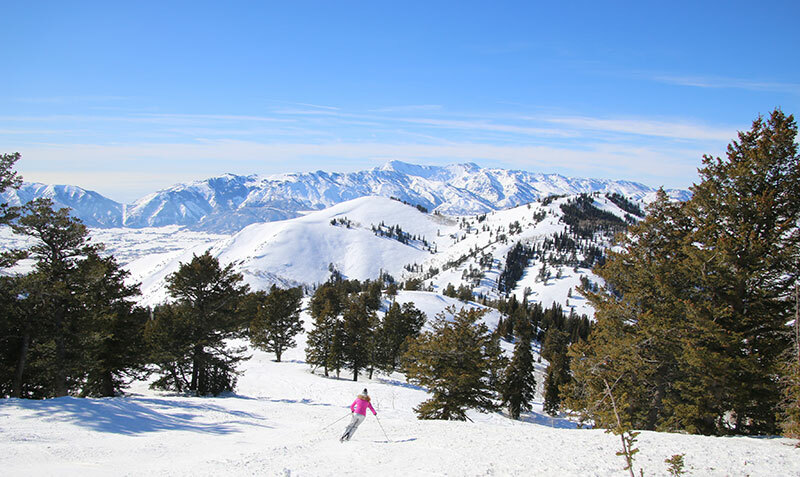 Include skiing Snowbasin just a half hour away as part of your Utah family ski trip.